Andy Peaks wants to see his AFC Rushden & Diamonds team do themselves justice during a tough run of home matches, which starts with a clash against Banbury United at Hayden Road this weekend. Diamonds broke through the 40-point barrier, which Peaks had targeted to preserve their Step 3 status, with a 3-1 victory at Bedworth United last Saturday thanks to a brace from top scorer Tom Lorraine and a Declan Rogers goal. 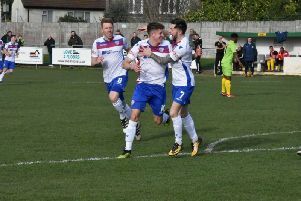 The win kept Diamonds firmly in the mix for the play-off positions in the Evo-Stik League South Premier Division Central. Six of their next eight home league matches are against teams in the top 10 but Diamonds have lost just twice in their last 14 league games with one of them being a 1-0 defeat at Banbury on November 20. There were no arguments from Peaks on that night as his team under-performed and were well beaten by the Puritans despite the narrow scoreline. Indeed, the Diamonds boss believes Banbury are as well-equipped as any team to launch a charge towards the top five in the final third of the season. But, having reached the safety net of points, Peaks now wants to see his team stay in contention for as long as possible. “All the games are challenging and we have a tough run of matches coming up at home,” he said. “We have taken seven points out of the last nine and now I am looking forward to seeing what we can do. “I just want us to do ourselves justice. “Banbury are probably the best side I have seen against us on that night but it was one of the few times this season when I was disappointed with our performance. “The 1-0 flattered us massively and we did well to keep it to that. Of all the teams that could potentially force their way into that top five, I think Banbury could. “They have players who are good enough to have them right up there. If anything, when you look at their squad, they have probably underachieved so far. “It’s going to be a really tough game but it’s one we can look forward to because we have put points on the board in our recent matches. “I am pleased. We have had a good season so far and we are on a good run. “Even when our performances have not been great, we have been able to get something from matches.